I just arrived home from nearly a month in the Midwest. All of my trips to LauraLand have multiple purposes: research, presentations, networking, research, dining on Midwestern specialties (oh, there is no bacon like an upper Midwest bacon! ), research, photography, research, museum visits, research, scouting for the next conference, and more research. But another activity I seek out is ANYTHING going on in the local area which simply can’t be done at home. (Again, with the bacon!) 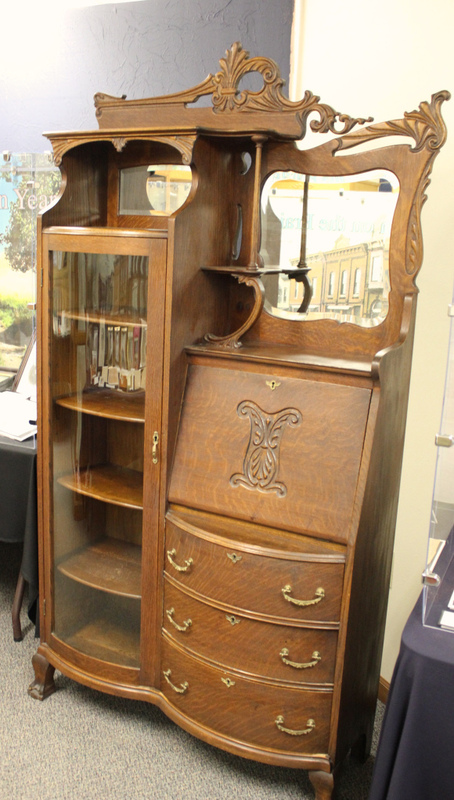 This year, as in 2011, I happened to be in the right place at the right time and heard about an upcoming auction which *supposedly* featured a “secretary” desk/cabinet which had once belonged to Laura’s youngest sister Grace and her husband, Nate Dow. The auction was happening a few towns away from where I was staying (Brookings, SD) and a few towns from where Grace and Nate used to live (Manchester, SD). Finally, the pragmatist in me told the more sentimental and romantic parts of me to shove off and let it go. After all, even if it was real, and even if no one else was bidding high, and somehow I could afford it, well, there was just no way I could get it to fit in the car and drive it all the way home to New Hampshire and, besides, shipping it safely would be a logistical and financial nightmare. So, no, I didn’t go. And, it is just as well that I didn’t! As it turns out, a few people in-the-know, and with a big enough wallet to do so, were bidding it up…against the Laura Ingalls Wilder Memorial Society in DeSmet! After a lot of heartaching, and many bid increases, the secretary went home with a lucky buyer…and I’m happy to report that the winning bid came from the Memorial Society! The scramble to own a previously-unknown Ingalls artifact ended in the best way possible (well, except for those of us who dreamt of owning it ourselves). Nate and Grace Ingalls Dow’s 1908 secretary, complete with original shipping tag on the back, is safely in its new home at the Memorial Society, just a scant 7 or 8 miles from the original destination on that shipping tag. As it should be! 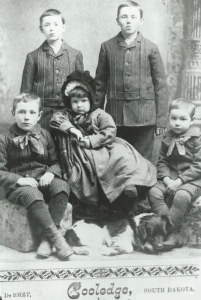 We are very excited to announce the “coming home” of a unique and valuable Ingalls Family possession. This month, one of our board members attended the estate auction of Patricia Schneider of Howard, South Dakota. Mrs. Schneider had in her possession a “secretary with glass door and shelves” that originally belonged to Nathan and Grace Ingalls Dow of Manchester. After a stressful and heated bidding session with a phone-in customer from Omaha, the Laura Ingalls Wilder Memorial Society won the highest bid. Then, the secretary came home to Ma and Pa’s home on Third Street in De Smet, South Dakota.